Parents should comfort their children, reassure kids that synagogue is a safe place, let them know there are security measures in place if kids ask and encourage them to think of tangible ways to help, the education director at a Seattle synagogue wrote to parents. Rabbi Janine Schloss, the director of education at Seattle’s Temple Beth Am, spent much of her Saturday — the Sabbath — finishing drafts of letters to teachers and the 625 parents who send their children to the temple’s religious school. “That’s all we’ve been doing all day — to craft the right message, to get people through this,” Schloss said, speaking of the Saturday morning shooting at a Pittsburgh synagogue, the Tree of Life Congregation, in which a gunman, who is believed to have posted anti-Semitic messages online, killed 11 people and injured several others. It’s also frightening, she said, how many previous letters about shootings and bombings she could refer to in her search for the right words now. Parents should comfort their children, reassure kids that synagogue is a safe place, let them know there are security measures in place if kids ask and encourage them to think of tangible ways they could help, Schloss said she wrote in her letter to parents. The shooting left synagogues across the Seattle area on high alert Saturday as they continued services. The “act of domestic terrorism” wouldn’t stop Jews from celebrating the Sabbath and going on with their normal spiritual lives, said Senior Rabbi Daniel Weiner of Temple De Hirsch Sinai in Seattle’s Capitol Hill neighborhood. As at most synagogues across the country, security has become a constant presence at Temple De Hirsch Sinai, Weiner said. The synagogue began posting guards in 2000, after a self-avowed white supremacist on parole in Washington state opened fire at a Jewish community center in Los Angeles, wounding five people. The shooter also killed a mail carrier. The need for security became more pressing in 2006, Weiner said, after a Tri-Cities man attacked the Jewish Federation of Greater Seattle in Belltown, fatally shooting one woman and wounding five others. Two security guards stood watch outside the synagogue Saturday, and a Seattle police cruiser rolled past as Weiner spoke with media. Local police departments, including Seattle and Bellevue, said they were boosting patrols in response to the shooting. 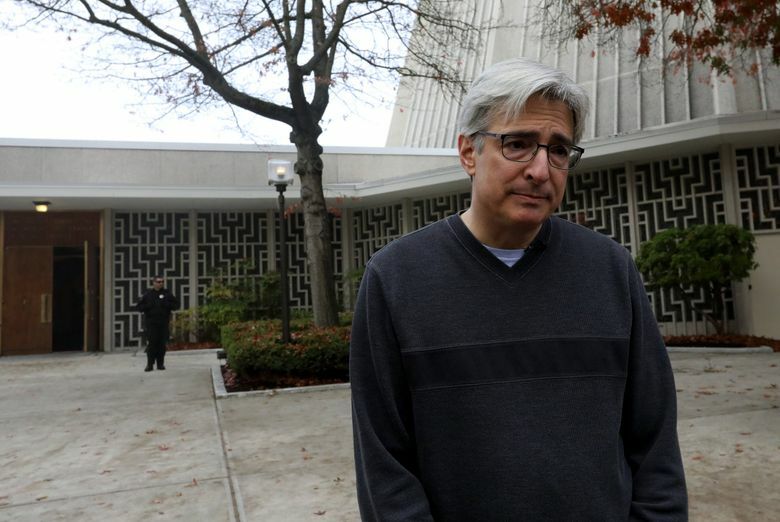 Nor would the shooting stop religious school at Temple Beth Am this week. In letters to teachers, Schloss directed them not to bring up the shooting with younger students, but to respond calmly and assuringly if the children spoke of it. For older children, Schloss said events like these prompt theological conversations about belief and the role of God in their lives. With events as incomprehensible as the recent shooting, “we all get thrown,” Schloss said. When people peacefully practicing their religion are shot in a synagogue, it challenges belief. “We talk a lot about Jewish values — repairing our world. Judaism has a tradition of believing the world is shattered and broken, and our job is to fix it,” she said. In times like these, the world feels extra shattered, Schloss said.